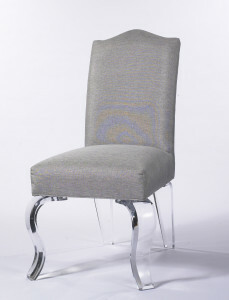 Acrylic chairs can go ultra modern, as in this stock photo, or they can be used in more traditional settings, says designer Karen Giffel. Philippe Starck’s iconic acrylic “Ghost” chair has won admirers and imitators around the world. But have you ever wondered if such a contemporary piece can work in a more traditional home? The answer, says interior designer Karen Giffel, is a resounding yes. 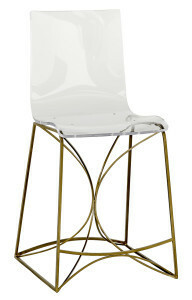 Some of Giffel’s favorite acrylic-accented items from her most recent market trip to Atlanta include Pebblehill Designs’ “Mariah” chair, with its comfy upholstered top and curvaceous acrylic legs, and Gabby’s “Angela” Lucite counter stool, which pairs a gold-hued base with a clear molded seat. For more of Giffel’s top picks from market, check out her article from the October issue.